DUG Insight User ManualFrequently Asked QuestionsFrequently Asked Questions Insight Error MessagesDisplay driver has stopped responding. What should I do? This is a common error message that occurs with any NVIDIA card on any Windows operating system. When the computer detects that your graphics card is not responding, the screen goes black for a few seconds followed by the pop-up box below, and the software utilising the graphics card would stopped working. The cause of this error is not an obvious one. It could be a corrupted or outdated graphics card, power supply, ram or overheating. If this error persists, follow the steps below to troubleshoot. Note: If, at any time, you are not familiar or are uncomfortable performing any of the solutions below, please consult your IT department. Open your Control Panel from the Start menu and click on Hardware and Sound. At Preferred plans, click on High performance to choose it as your preferred plan. Click on Change plan settings for High performance and select Change advanced power settings to display the advanced settings. Scroll down and expand PCI Express. 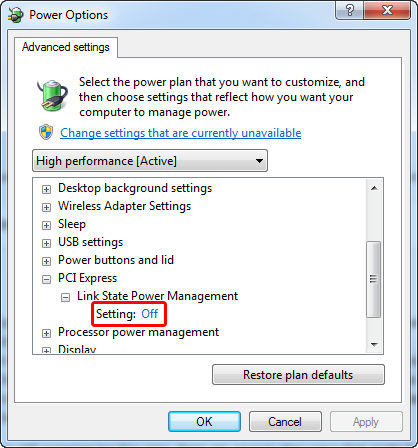 Turn off the Link State Power Management setting. Click Apply to save the settings and click Ok to close the window. If you are still experiencing this error, there are several other ways that might fix the problem. Under Devices and Printers, click on Device Manager. Expand the Display adapters. 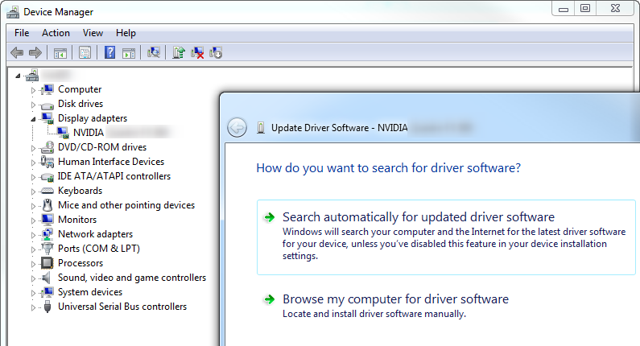 Right-click on the graphics card and select Update Driver Software. Update to the latest driver software. Open your Control Panel from the Start menu and click on System and Security. At Windows Update, click Check for updates. If there are updates to be installed, click Install updates to begin installing. If the error does not go away, it could be a faulty RAM or your display drivers are overheating. To check your RAM, simply remove all the RAM sticks except one and see if it fixes the problem. Repeat this until you have found the faulty RAM stick. If the error happens no matter which RAM stick you put in, that means the RAM is not the problem here. To check the temperature of your display driver, you can download any PC hardware monitoring program. If you find that the temperature increases rapidly when using a graphic intensive software, you can either try cleaning the driver's cooling fan or installing new fans. Note: If you are not familiar or are uncomfortable performing any of the solutions above, please consult your IT department. If the problem persists, or if you have any questions, feel free to contact our support team at support@dugeo.com. Next: Installation of Insight failed! What should I do?